Freshwater aquaculture production in Indonesia has significant contribution to the total aquaculture production. In 2012 freshwater aquaculture production was 2.15 million tons or 68% of the total aquaculture production of 3.16 million tons (excluding seaweed). The major commodities cultured are common carp, tilpia, pangasius, giant gouramy, African catfish, java carp, and freshwater prawn. Small-scale freshwater aquaculture extension is very important to assist the fish farmers in the region. In the context of aquaculture technological extension, this paper and accompanying presentation reveal how the government and key UN partners, initiated the farming and breeding of Asian and Indian major carps in the country between 1965 up to late 1970s. Emphasis is given on bighead carp Aristichthys nobilis, which as per 2011 and 2012 official agricultural statistics, ranked 3rd in freshwater aquaculture (17,464 MT) and 6th on inland capture fisheries output (12,119 MT). Promoting small-scale freshwater fish farming in Côte d’Ivoire was done in two stages. First was awareness and establishment stage (1974-1990) implemented by dense and diverse state support. The second was the professional stage (1992-2002) executed by specific regional projects. Activities targeted small-scale fish farming including promotion of quality amenities, reproducible by the promoters; marketing; and the promotion of research and development focused on the needs of stakeholders. Fisheries resources play a very important role in Malawi’s national economy, in terms of food and nutritional security of the population. It contributes about 60-70% of annual animal protein supply of the nation. In fact, fish is the readily available source of animal proteins consumed in small amounts among Malawian daily meals, thereby nutritionally supplementing essential amino acids in their diet. Fisheries provides source of employment to over 300,000 people through fishing and associated activities. The largest percentage of aquaculture production in Zambia comes from small-scale fish farmers. This is mainly because there are many small scale fish farmers compared to other categories. In comparison to small-scale fish farmers, there are very few commercial or large-scale fish farmers. This situation suggests that one of the ways for effectively increasing aquaculture production is to improve fishpond productivity and commercialization of aquaculture production systems. Regional workshop on freshwater extension approaches in Africa, held at the International Symposium on Small-scale Freshwater Aquaculture Extension. Summary of discussion group 1 findings. Summary of discussion group 2's findings. Special session on regional cooperation for improved biosecurity. 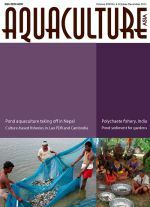 Pond aquaculture taking off in Nepal. Introduction of culture-based fishery practices in small water bodies in Cambodia: Issues and strategies. A case study on polychaete fishery by the Irular tribal fishing community on the Tamil Nadu coast. Use of pangasius pond sediment for rooftop bag gardening: Potential for rural-urban integrated agriculture-horticulture. Culture-based fisheries exchanges between Lao PDR and Cambodia.